Braun boldly states that their Series 3 shavers are tough on the beard and smooth on the skin. The Series 3 380s-4 is one of the best-selling razors of this line and should be a worthy representative. Read our review to see if there really aren’t any compromises. That is quite an extensive list of features for an entry-level razor, but the ones we’re especially interested are the first two, as everything else is pretty much what you’d expect from a decent electric shaver. Here is a breakdown of what the gimmicky terms really mean. Braun opted for a different type of foil perforations instead of going with the usual pattern that other manufacturers use. According to them this should capture short hairs more efficiently and ensure less skin irritation. 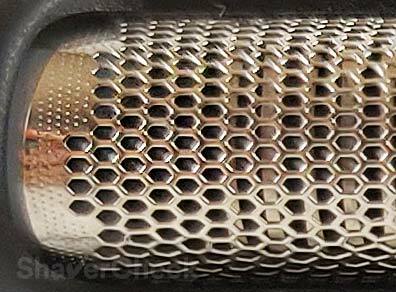 Although it is difficult for anyone to accurately confirm this, the new design does seem more effective with these honeycomb-like holes. You can check out a 3D animation of the SensoFoil here. The Series 3 380s-4 has two foils for shaving short hairs and one middle trimmer for cutting long hairs. The three cutting elements move independently, so it should be easier to adapt to the contours of your face. See them in action here. The Braun Series 3 380s-4 feels sturdy and solid in hand, without being too heavy. It has a nice hefty feel to it that is pretty reassuring. There are rubbery areas on the sides that ensure a very secure grip. On the visual side, the blue and black color scheme doesn’t look half bad. The shaving head is not as bulky as on Panasonic foil shavers, making it easier to maneuver. Precisely, there’s no plastic frame surrounding the cutting elements. Another feature worth pointing out is the presence of the Precision setting switch. Basically, when you slide the switch to the right, the central trimmer and one of the foils will be lowered, allowing for precise handling in hard to shave areas—like under the nose. To be perfectly honest, it’s not as necessary as in the case of other electric razors with larger and more complex shaving heads. I’ve used other Series 3 models that lack the precision switch and didn’t miss it at all. The battery life for this razor is very good. On average, the 45 minutes promised by Braun should be enough for a couple of weeks, depending on your shaving routine. Charging can be done with or without the stand as the power cord can be plugged directly into the shaver. There is also a 5 minutes Quick Charge option that will provide enough power for one shave. Having an automatic worldwide voltage adjustment, it will adapt to any voltage between 100-240v, so you can use it when traveling abroad. Unfortunately it can’t be used while charging. Braun didn’t allow this type of functionality to its wet/dry shavers as a safety precaution. Cleaning the 380s-4 is dead easy: just turn the shaver on and rinse the shaver head with warm tap water. You can also use liquid soap for a more thorough cleaning. After that, just turn it off, remove the foil and cutter block and let it dry. 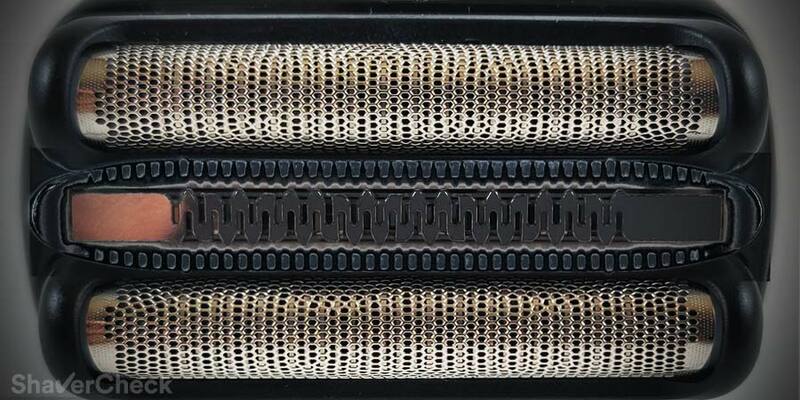 There is also a cleaning brush included that can be used to clean the inner area of the shaver head. Just don’t use it on the foil and cutter as they can be damaged easily. You won’t get a Clean & Renew System with this shaver though. If you really want one check out the alternative shavers section at the end of this review. Every once in while you should use the included tube of light machine oil to lubricate the foil and central trimmer for optimal performance. The Braun 380s-4 works great with moderate beards, providing reasonably close and irritation free shaves. It is also effective when cutting the stray hairs, especially on the neck area. It’s still a basic shaver, so don’t expect anything magical though. The Series 3 380s-4 works well when used with shaving cream or in the shower, but to be perfectly honest it didn’t improve the closeness to a significant degree, so you’ll probably want to stick to a quick dry shave. While the closeness will be good enough for most men, it won’t shave as close as Panasonic’s entry-level shavers from the Arc 3 family. The pop-up trimmer is a welcome addition, very handy for all-around grooming and trims. The positioning is really good as the shaving head doesn’t get in the way. However, it’s not as sharp and effective as the ones on Panasonic shavers. Unfortunately there isn’t a protective cap for the foils, but the case pretty much makes up for that. Braun says that you should change them every 18 months, which is longer than what other manufacturers recommend. You will be notified by an indicator when it is time to replace them, but you can reset it by pressing the ON/OFF switch for 5 seconds. Or just wait for the next 7 shaves and it will reset automatically. The 32s/32b cassettes are widely available and reasonably priced, so that’s a plus for the costs of ownership associated with the 380s-4. Braun has come a long way with this Series 3 range of shavers. It really is a massive improvement in quality and performance over the old generation. Braun Series 3 380s-4 is a great all around shaver that I would highly recommend to anyone looking for an affordable foil shaver. It’s also suitable for wet & dry use, so if shaving in the shower is your thing, you can’t go wrong with this one. It’s better with longer hair than most foil shavers in this price range, so if you shave every 2 days or so definitely give this one a try. It’s also a great choice for beginners, especially if you can find it at a discount. The 380s-4 is nowadays discontinued and probably nowhere to be found anymore. Luckily, there are newer models available from the revamped Series 3. 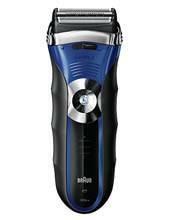 One such shaver is the Series 3 ProSkin 3040s. It uses the same shaving head and it’s also suitable for wet & dry use. The precision lock is gone, but you won’t be missing it. If a cleaning station is a must have, you can go for a slightly more expensive Braun Series 3 3050cc which comes with a Clean & Renew System. Keep in mind though that you won’t be able to use it for wet shaving. Another great option is the Panasonic ES8103S that we reviewed here. It’s a solid shaver that while not as comfortable as the Series 3, it will provide a slightly closer shave in most cases. Need to buy a new shaving head (foil and cutter) , for my Braun shaver series 3 380s-4, thanks. Glad to hear you found this article useful. You can find the cassette model for your shaver in the Replacement parts availability section above. I have had one for over 7 years now and have never changed the shaving head and it still give a good shave….however, last week it just stopped working and a red light flashes on the on/off button when I try to turn it on. I have charged it fully. After 7 years I guess the rechargeable battery has given up the ghost. Is there a way of replacing the battery? Hi Allan, I would strongly recommend to contact a Braun authorized service center and get a price quotation. Considering the cost of the operation and of a new battery it just might be more convenient to buy a new Series 3. On average, how many shaves can you get from one charge of a Braun Series 3 380s-4 razor? assuming your average shaving session takes 5 minutes, I would say probably 8 shaves from one charge.